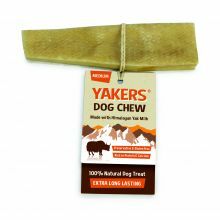 YAKERS 100% Natural Dog Chews, made with Himalayan Yak Milk! YAKERS dog chews are suitable for all dogs over 4 months old, and are ideal for serious chewers, these are softer in comparison to extra tough Antlers & Buffalo Horns but much, much tougher than a standard dog chew. YAKERS dog chews are low in fat at only 5.2% so are a super healthy and tasty treat your dog, they are also long-lasting, natural, gluten-free, rich in calcium and protein, these vegetarian chews are a hard cheese that slowly softens as the dog chews on it which means they are great for removing plaque and promoting oral health. How large are the chews? Each YAKERS dog chew will be slightly different in shape, size as they a 100% natural product. The medium weights 70g on average, with the Extra Large weighing around 140g on average.